If you attended EXL401, you got a good, deep understanding of how the HA features of Exchange 2010 work, but how do you apply those features in a real world environment? 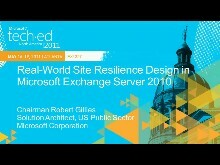 This session will talk about some real customer issues and some of the most heard questions around how to best architect to meet your messaging high availability and site resilience requirements with Exchange 2010 SP2. Please could you fix the link to the slides ppt?